I was determined to get out and fish this week, but I have been beaten by the winter weather each time I planned to go. Yesterday it rained non stop, then today I awoke to a heavy snow fall, the snowflakes freezing to the van windscreen, due to an icy blast, that pushed temperatures below zero. Then a chink of hope appeared, as the grey sky gave way to clear blue with bright winter sunshine. Already committed during the morning, I thawed bread from the freezer and set off after 1 pm for my local river, where I hoped to find a few obliging chub. Loading my trolley from the van, the wind was cutting through me, despite several layers over my thermals and I wondered how long I last without a fish, or two. Considering the earlier snow and rain, the river was only slightly coloured, with a steady pace and I was quite hopeful, as I set up my pole. Due to the temperature, I was convinced that bites would be slow, having intended to set up a canal antenna float, but with the pace of the flow and the gusting downstream wind, opted for a lightweight 2 No 4 stick, dotted down to the tip. Putting in two egg sized balls of liquidised bread, one just past the middle, the other in line with the overhanging bush, I had watched the bread cloud sweep downstream on the outside line, so started in the slacker water on the inside of the bend. With a 5 mm pellet of punched bread on a size 18 hook, the float dipped a fraction, sending out a an indicating ring, then submerged slightly and remained there. 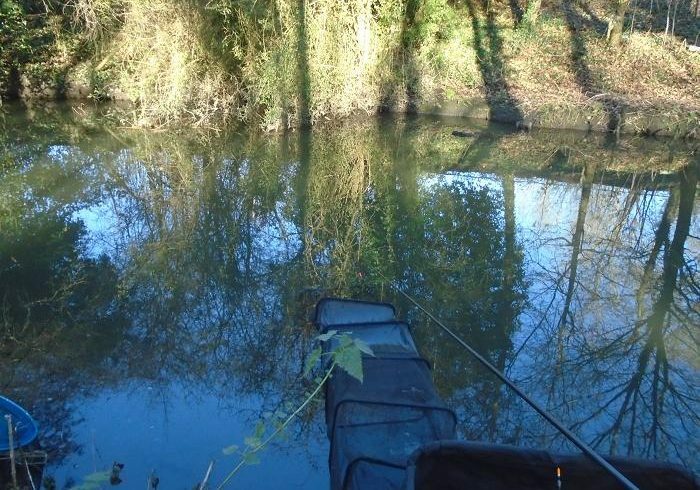 Lifting the pole, the elastic came out and stayed put as a decent fish woke up, then burst into life, dashing off downstream against the No 6 elastic, before turning to run hard upstream past me. With the pole at four metres, I held the chub in mid stream and pushed my landing net out to meet it, pulling back the pound and a half fish. The tiny barbless hook was just in the tip of the lip, falling out once the pressure was off in the net. Without feeding again, I cast back in, watching the float give the faintest of indications of a bite, as it moved downstream, waiting for something to strike at. I held the float back slightly and the float slowly sank, lifting again to solid resistance, as another chub beat a retreat down stream. This fish was smaller, close to a pound, but full of fight, stretching out the elastic as it dived around, searching for a snag, but the elastic did its job, bringing the chub within netting range, the inside bend being shallow with silt. Two decent chub in two casts, this what I came for. 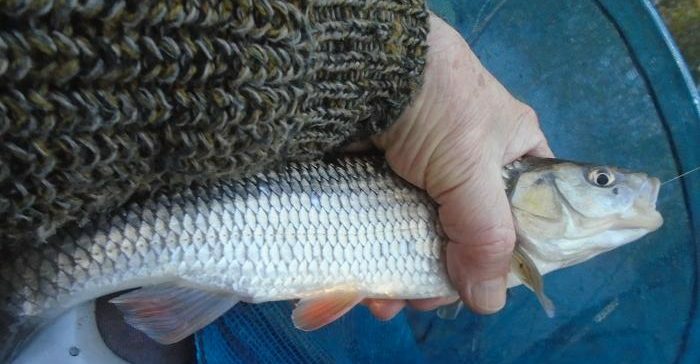 Even on the coldest of days, chub will usually feed, small hooks and baits, often better than the opposite. I paused for my first cup of piping hot tea, the sun shining through the trees warming my back, while my front and hands were already getting frozen, those chub feeling like blocks of ice. 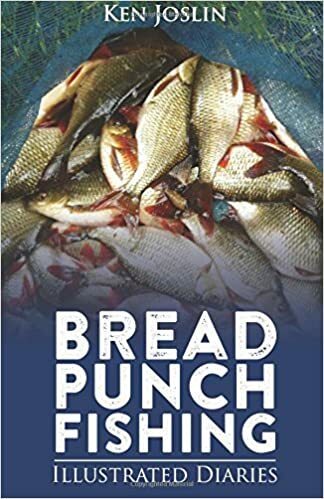 I ventured in another ball of bread past middle and cast beyond it, holding back then letting the float run, the float tipping and dipping as it followed through the swim. Lifting out the bait was gone. This repeated for a couple more trots. Something was down there, sucking the bait from the hook. I tried a punch of rolled bread, squeezing it on the hook, the float holding down long enough to strike, bringing a small roach splashing to the surface. Two more small roach from four trots saw me deepen up six inches to hold back hard, easing down on a tight line, but I was back to no bait, this time without a sign of a bite. These fish were so cold, that they were like iced lolly pops and must have been just sucking at the bait. I shallowed up again and chanced another ball of bread, following it down. Nibble, nibble, hold. Strike! A tiny roach. In again, nibble, nibble, hold. Strike! Bottom. No! Another chub dashed off downstream, rolled on the surface and came off! Blow it! That was a good fish of well over a pound. Time for another cup of hot tea and a packet of mini chocolate Penguins, resting the pole, with the float well over depth, while I got my brain back together. Tap, tap, pull, the float sank. Missed it, but the bait was still on. Shallowing up again, I ran it through several times over the feed, without a sign of a bite, the punch untouched. An intermittent bite resulting in a four inch roach hanging itself at the end of the the trot, finished the session for me. The sun had gone behind the houses and the temperature had dropped noticeably. This was no fun any more and before the men in white coats came to take me away, I packed up. The sign of a slow ninety minutes. That third chub would have topped it for me, but I can’t really complain, with two nice chub to show for a session in the deep freeze. You don’t have to be bonkers to fish on days like this, but it helps.